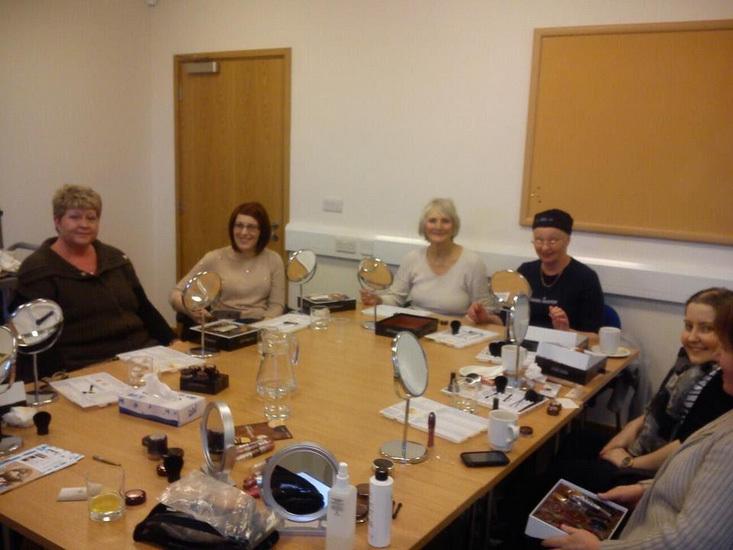 Six times a year I go to my local Cancer Support centre and in conjunction with a local breast cancer charity, who provide all of the products for each woman, I run a specialist make up workshop for women undergoing Chemotherapy and Radiotherapy. For ladies undergoing any kind of cancer treatment it’s tough, the sickness, the stomach problems, the skin problems and all of the other hideous side effects are enough to deal with, but to top it off they look in the mirror and see a complete stranger staring back at them. One with a puffy face, sensitive skin and probably no hair, brows or lashes either. That’s where I come in. Using safe mineral based products I teach the ladies how to get back to their real selves again. To give their skin a glow, to create the brows and lashes that are often missing. Each class begins in the same way, a group of ladies all going through the same process, they come in wearing wigs and scarves, politely say hello to each other and sit patiently waiting to see what I’m going to do. I make them take their make up off, I make them sit in front of mirrors and they try not to look to closely at themselves. I also make them laugh, all of these classes have one thing in common, there’s a lot of laughter and quite often some mischief. My quiet group of ladies gradually begin to metamorphosize into something amazing as the class progresses. If you throw a bunch of men together they will sit and talk but after an hour they will know nothing about each other. Leave two complete strangers who are women alone for ten minutes they will know bucket loads about each other. It’s a strange but natural phnomena, women will always find common ground in a very short space of time. My group transforms from a collection of ladies who are suffering from an illness and it’s treatment side effects to a bunch of girls, all together with a big pile of make up. It never ceases to amaze me how rapidly these wonderful women get their glow back. The laughter increases, the wigs come off as the make up goes on. They feel safe and comfortable and they are having a lot of fun. This happens at every class, this great process, as they see their old selves begin to appear in the mirror. Occasionally there are tears of happiness, recently a young girl couldn’t get her breath when she looked in the mirror and saw herself ” I haven’t been beautiful for such a long time and look I feel beautiful and look like a real girl again”. She had always been beautiful, she just hadn’t felt that way because that’s what the treatment does, it hides their beauty and femininity, it dulls their glow. There are a lot of big smiles and heartfelt thanks and plans to suddenly go out that night. I’ve had daughters come with their mums to learn how to do their make up for them if they are too poorly to do it themselves, that’s a wonderful sight to see and great fun too. The daughters get to see their mums, their happy, glowing, laughing mums again and the smiles are infectious. I’ve had husbands who have come to collect wives who have thanked me, not only because their wives look lovely but because they are smiling and happy and back to themselves, even if only for a while. I was once told to never underestimate the power of make up. It’s true, I get to see it up close and personal every time I teach my classes. It has the power to restore, the power to lift and the power to help heal. Out of all of the professional make up work that I do, these classes will always be my favourite, my most worthwhile, my most fun. I love my job. It would be wonderful one day, for their to be no one that needs my make up services for cancer patients, I’d happily be unemployed in that department, but until that day I am making the most of my time with these women, it’s something very special and I owe them thanks for teaching me so much in return.